Indoor maps are becoming the hot new thing in the world of not getting lost. Google may be using fancy 3D planes to map everything the sky can see, but sometimes it's just as easy to get lost in a train station as it is in a city. 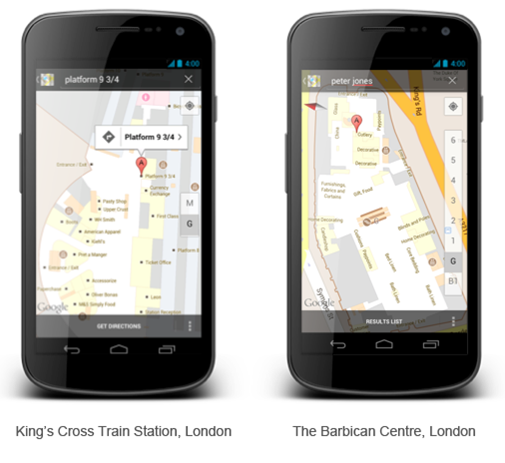 Google's recent indoor maps have made navigating easier, and now UK locations are being added to the supported list. The maps have been seamlessly integrated into the Google Maps app. Just zoom in to a location and the indoor maps will "magically" appear. You can even search for directions from within the building, across multiple floors. Google says that over 40 venues are supported, most of them being train stations, museums and malls. Otherwise known as all the places people get lost in. If you're in the UK and you're not sure how this navigation thing works because you haven't been outdoors since the last time it stopped raining three years ago, fire up the app and give it a go. It's neat.